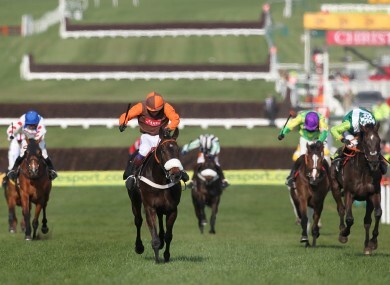 Long Run (second from right) stays on up the hill to win last year's Cheltenham Gold Cup. LONG RUN IS to shed his earplugs in a bid t0 reverse back-to-back defeats against Kauto Star, trainer Nicky Henderson said. The reigning Cheltenham Gold Cup champion has worn earplugs, which filter out on-course noise and help horses to stay relaxed before a race, since his British chasing debut in December 2009. But disappointing losses to a resurgent Kauto Star in the Betfair Chase at Haydock as well as last month’s King George VI Chase at Kempton have forced connections to rethink their tactics in the run-up to the Gold Cup showdown between the two in March. “We have spent a lot of time settling him down and have always run him in earplugs,” Henderson told AtTheRaces. Long Run is likely to have one final prep run without earplugs in the Denman (formerly Aon) Chase at Newbury on 11 February, while Paul Nicholls has indicated that he will wrap up Kauto Star until the trip to the Cotswolds. Kauto Star has won this season’s meetings by eighth lengths and one-and-a-quarter lengths respectively but Henderson seems confident that Long Run can stick to his gameplan and still reverse the recent form. Email “Long Run plugs out to boost Cheltenham chances”. Feedback on “Long Run plugs out to boost Cheltenham chances”.